How to Encrypt iPhone Backup with Best iPhone Backup Software? How to Encrypt iPhone Backup & Protect Your iPhone Data? With data security becoming an increasingly hot search, it's all the more imperative that you find the best way to encrypt iPhone backup. Although iTunes already natively support to encrypt iPhone backup, yet if you're like me, doesn't really want to stay with iTunes to encrypt local backup, take a look at this tool recommended below – probably the best ever iPhone backup software with encryption method we've ever find. ★ Clean & green, no malware or adware, no data loss. 1. Why Should I Encrypt iPhone Backup? What Does Encryption Mean? 3. How to Encrypt iPhone Backup? Section A: How to Encrypt iPhone Backup? Section B: How to Restore Encrypted iPhone Backup Files? Section C: How to Turn Off Encrypted iPhone Backup? 1. Why Should I Encrypt iPhone Backup? What Does Encryption Mean? Taking a second look at all your data on iPhone: photos, music, videos & password, Wi-Fi setting, web history, Health Data, etc…. it seems like a bit of dangerous if you back up the more private information, like your saved password and browsing histories into a file without encryption. What if someone else find out your backup files? Isn't it much easier if you use a small trick like encrypting iPhone backup to protect them once and for all? For another, there are 4 types of iPhone data, aka: Saved password, website browsing histories, Wi-Fi settings, and health data that could only be included in an iPhone backup process when set password to it. By default, if you stay with iTunes to backup iPhone data, it only allows your account password & health data to be backed up when you check "encrypt iPhone backup". That been said, if you want to include all your passwords and some other private data in the backup files, you need to encrypt iPhone backup. Tips and Notes: There's no way to restore from an encrypted iPhone backup if you lost or forgot the encryption password, so make sure you keep the password remembered. To actually encrypt iPhone backups, make sure that your iOS software & iTunes are in the latest version. You'll need to set a password for your backup files, which will be required when you restore an encrypted backup files. Make sure that you remember the password. A backup process usually takes up 20 minutes, depending on your backup file size. So make sure that your iPhone is plugged-in in case the backup halts half-way. Also note that backup files made of iPhone with a newer version of iOS software couldn't be restored to an iPhone with earlier iOS software versions. 3. 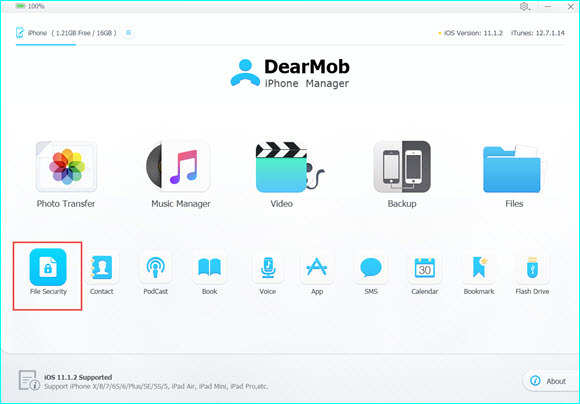 How to Encrypt iPhone Backup with DearMob iPhone Manager? 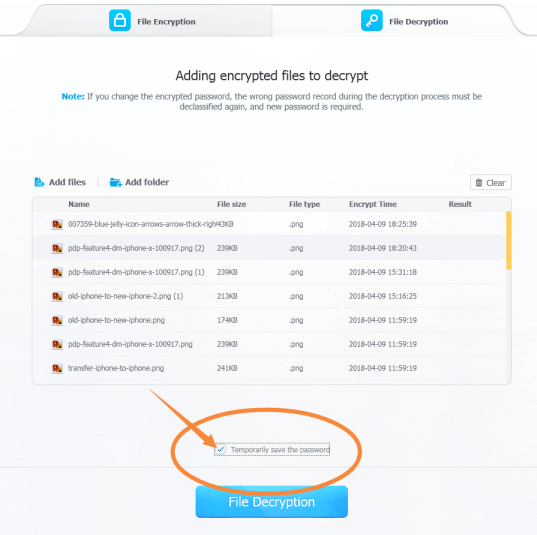 Section A: How to Encrypt iPhone Backup with Best Encryprion Software? DearMob iPhone Manager is simply the best encryption software for iPhone iPad to encrypt files. You can rely on it not only to encrypt iPhone backup, but also transfer photos, music & videos between iPhone and PC/Mac as fast as light. Now check through how to encrypt iPhone backup with DearMob iPhone Manager. Step 1: Let's assume that you've already installed this best iPhone backup software on Windows or Mac, now launch it before you USB connect iPhone to computer. 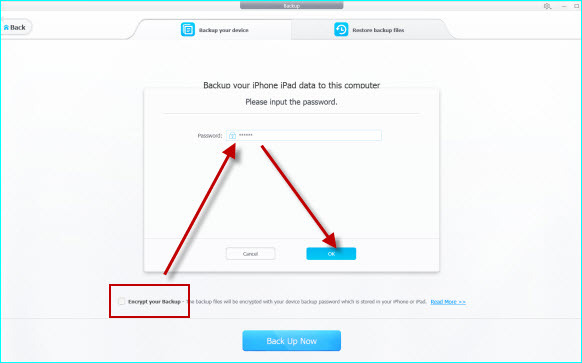 Step 2: Click on "backup" icon on the main interface, which takes you to the next page saying "Backup Your iPhone iPad Data to this Computer". 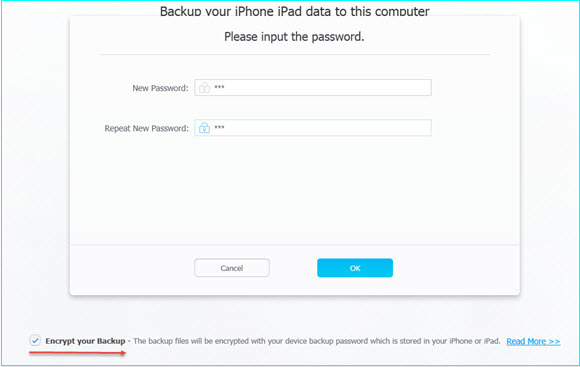 Step 3: In order to encrypt iPhone backup, check the "encrypt your backup" in the bottom-middle place of its interface before you click on "Backup Up Now". Step 4: A complete backup process usually takes up 15 to 25 minutes, please make sure that you have this time spare to keep your iPhone connected throughout your backup process before you click on "OK". * You can start to encrypt iPhone backup only when you click on "OK". Step 1: Repeat step 1, 2 in Section A, and when you're in the page which allows you to restore backup files, switch the top-banner from "Backup Your Device" to "Restore Backup Files". Step 2: Locate to the very encrypted backup files (you may restore the latest backup, or restore from a backup file of a specific date). Step 3: Enter the password you used to encrypt iPhone backup to restore the file. Tips and Notes: What if I forgot encrypted iPhone backup password? Read this guide to get quick solution to iPhone backup encryption passcode lost. You can continue to backup iPhone data, encrypt iPhone backup, or restore from unencrypted backup files, yet unable to restore iPhone backup. Step 1: Repeat step 1, 2 in section A. Before you click on "Backup Now", make sure that you uncheck "encrypt iPhone backup". Step 2: If you've set your password for iPhone data backup once, type your password to turn off encrypted iPhone backup. Step 3: Proceed to the next page and click on "OK" to start iPhone data backup. How to Backup iPhone without iTunes?